KEB' Mo' is less an international man of mystery, and more the bluesman of many quiet surprises. For a start, how many Delta blues singers have co-written a song for a hit album by a '70s super group, Jefferson Starship? How many live in the Nashville 'burbs with a young family? Have recorded a successful children's album? Taken on movie and television acting roles (in one, he played Robert Johnson in a TV documentary)? Won three Grammys? How many have a collection of lava lamps? Kevin Moore (his off-stage name) leans back into the plush black leather chair in front of the console in his home studio. It's 7.15pm, four degrees and snowing. "I hate shovellin' snow," he says looking out the double-glazed window across a winter-white yard. "I had to do the driveway this mornin' - uugh." He has been in the studio "tweaking" a few new songs, though he's in no hurry to release another album. "No one wants me to release half a dozen albums a year - there's a lot of music out there. "I think the music should have a say in when it gets played, recorded and released, y'know? "It just has to feel right." Behind the console are three large lava lamps, heating up great colourful wax clouds in water, releasing swirling, mesmerising plumes of psychedelia. Keb' looks and sounds younger than his 63 years. He talks slowly, deliberately, still with a distinctly West Coast accent, but with not quite as deep timbre as is the signature of his singing. He was born in Los Angeles in 1951. That year, Nat King Cole's Too Young topped the Billboard music charts, LA police savagely beat seven suspects in a police station - dubbed "Bloody Christmas" in the papers - sparking 39 sackings in the force, and the LA Rams won their gridiron conference. Always a good guitarist, by the time he was 20, Keb' somehow found himself in a steel-drum calypso band, as well as playing around the town with more orthodox musicians. He toured with violinist Papa John Creach and they became friends. Creach, although he had his own bands, played guest spots with Jefferson Starship, a folk-rock band based in San Francisco. Keb' and Creach wrote Get Fiddler, which turned up on Starship's chart-topping Red Octopus album. But he has had to be patient. He worked as a staff music writer for A&M Records and did give gigs to help to make ends meet. As Keb' said, his music was only just beginning to find its voice. Keb' Mo's debut self-titled album was released in 1994 on Okeh Records, a vintage revival division of Sony Music. In 1996, he released Just Like You, his second album, which featured 12 songs full of delta rhythms. He won his first Grammy Award for this album, which featured guest appearances from Jackson Browne and Bonnie Raitt. Keb' Mo', at age 46, took all he had learned and played it. He has not looked back, but has never forgotten how important space is to his music. "I'm the Gestapo when it comes to my band," he says. "People have to be able to hear the words - that's what makes a great song. "A guitarist playing a storm go notes isn't for me … it's much more subtle than that. "Songs need to be given space to breathe, otherwise they can't live." Keb' has just released his 12th album in a solo career that has stretched almost lazily to 20 years. "I started out with the idea to record a stripped-back version of the new songs - just me and the guitar," he said. "Somewhere in there, the songs took over and I started adding musicians to the whole thing. "It's a much fuller sound than I'd first thought, but I like it." His latest album, Blues Americana, is out now. 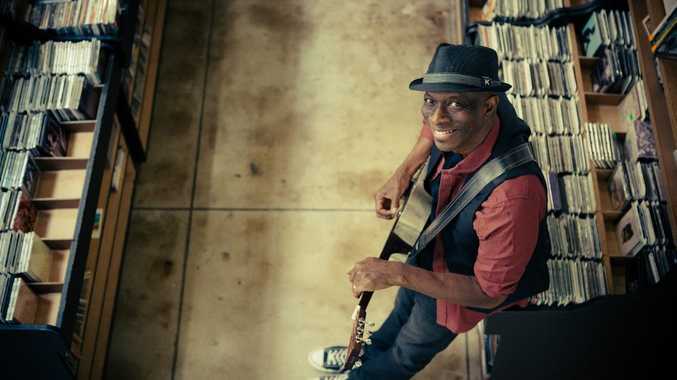 Keb' Mo' plays the Delta stage at Bluesfest tonight at 9.30pm and the Crossroads stage tomorrow at 2pm.